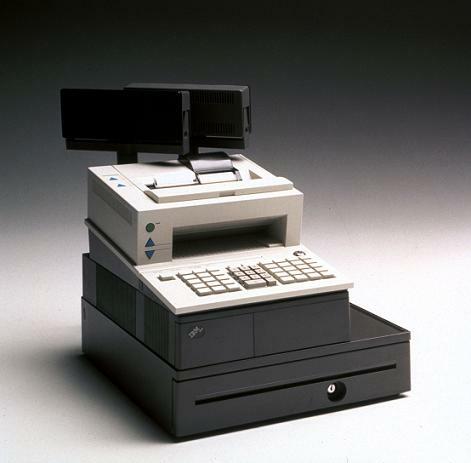 The IBM 4694 model 104 can be used as a controller/terminal, a terminal in a LAN or as a standalone terminal. The 104 is a 32 bit architecture terminal with a 5X86C 100MHz processor, 4 MB base memory, SVGA video with 1 Megabyte of video memory, a 1.44Megabyte floppy drive, two RS-232 ports, a PC keyboard & mouse port, four RS-485 Point of Sale I/O ports, two cash drawer ports, 2 full length ISA feature card slots and Ethernet 10BaseT standard on every terminal. The 104 has the capability to expand to 128 Megabytes of memory with four 72 pin, 60nS, fast page memory SIMM sockets that can contain any combination of 4, 8, 16 or 32MB SIMMs. The model 104 is a narrow footprint model and has the option for one 3.2GB or higher, 3.5 inch IDE Hard Disk Drive, a Token Ring or Store Loop adapter, the rear access Dump Switch and the Advanced Power Management feature. This model is suited to the customer with space constraints or the need for a smaller mechanical package for a distributed configuration, who is running 4690 OS or DOS.